With the dominant ways that both LSU and Alabama won this weekend, the BCS Championship game is all but set. The Hang Up and Listen podcast team wonderfully admonished everyone to stay away from the phrase "BCS chaos" from now on; but it's now unnecessary advice for the rest of this year's discussion about the championship game. We're going to get LSU and Alabama. The talking heads are even all about how LSU could lose next week to Georgia and still make the BCS Championship game (unlinked because I'm confident you've heard it already from somewhere). 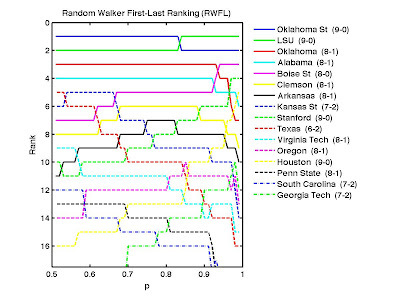 Our rankings (at p=0.75) for the full FBS and FCS are available on Kenneth Massey's College Football Ranking Comparison. One week later, and everything has changed. Your guess about what happens next is as good as mine (or probably better). As we just saw many ways this weekend, anything can happen. 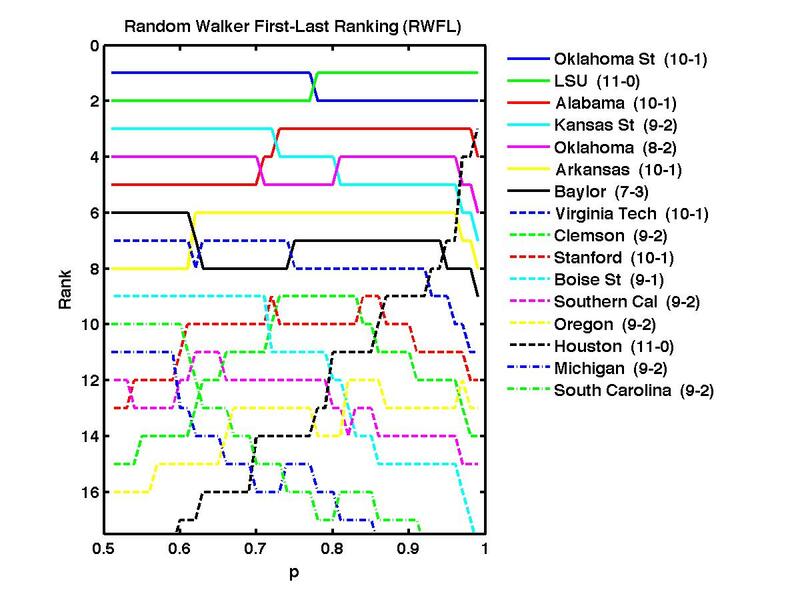 The big surprise (at least to me) in the RWFL rankings plotted below is that Oklahoma State is still ranked in the top two throughout here. 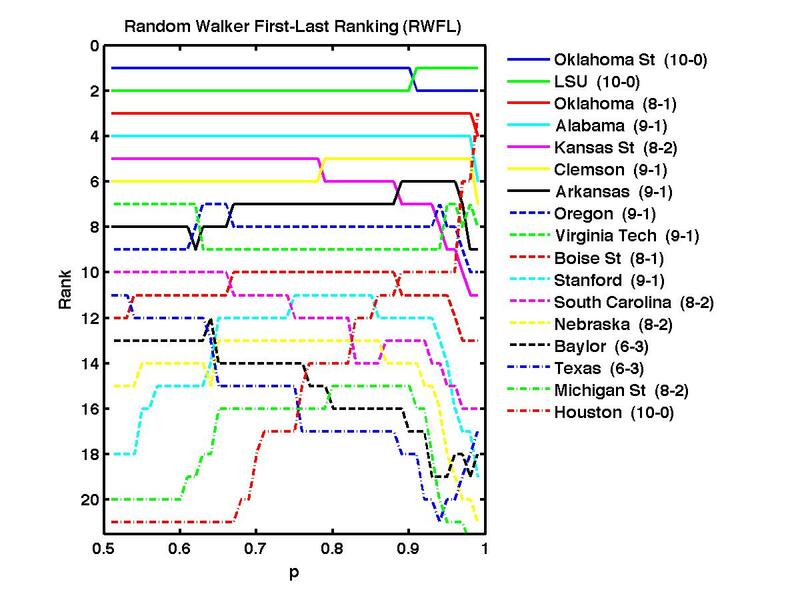 While the RWFL rankings have nothing to do with the official BCS Standings, we sometimes talk about using this family of rankings as a proxy for the different ways that the computer component of the BCS might turn out. 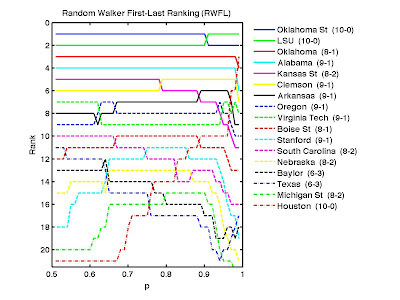 In this case, however, we need to stress one important difference: the RWFL rankings as calculated here do not use the dates of the games at all, unlike some of the computer rankings in the BCS. That is, these rankings treat the games of this past weekend no differently than a game in September (e.g., when Arkansas lost to Alabama). The dates of the games could be easily incorporated to weight more recent games more heavily if one wanted to do so; but that's another coefficient that would need to be picked, counter to our keep-it-simple philosophy here. 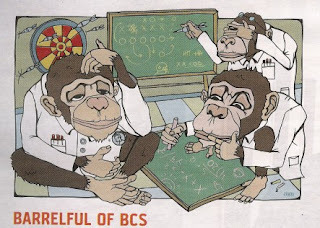 So it is an important way that we do not mimic the computer component of the BCS Standings. Looking at the computer components of last week's BCS Standings, where Arkansas was 6th (and three teams above them lost), I fully expect to see them much higher when the Standings come out tonight, further emphasizing the importance of their upcoming game with LSU. And then there were... three? No, sorry Houston, there's no way you're going to be part of the BCS discussion; but they nevertheless deserve congratulations for being one of the few undefeated FBS teams remaining at this point. As long as LSU and Oklahoma State keep winning, they will play for the championship. But their winning out is far from certain. Obviously, they can't look past anyone, and they have particularly tough tests before the end of the season, with LSU playing Arkansas and a tough SEC Championship opponent, and Oklahoma State still has Oklahoma on their schedule. While we wait for those tests, we call attention to the sharp changes on the right edge of the plot below of this week's RWFL rankings. 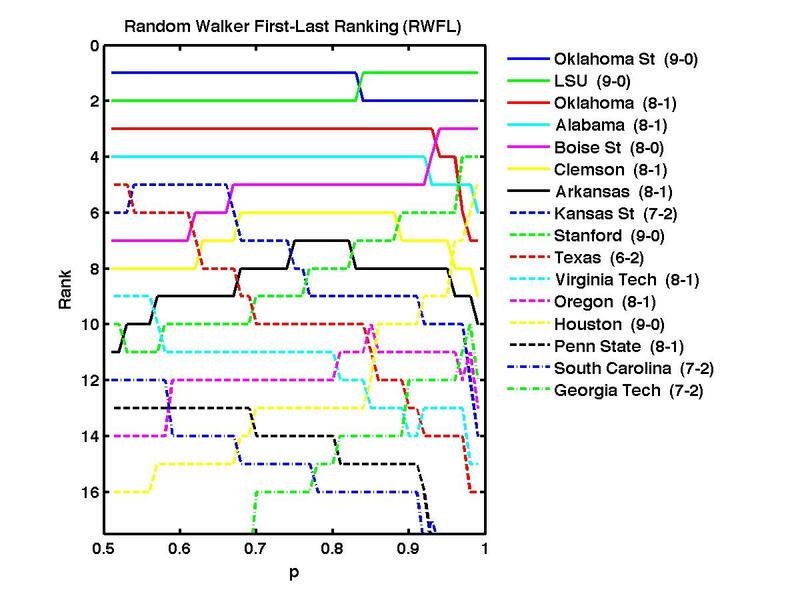 This gives us an opportunity to recall some of the features of this family of rankings as we consider different values of p. As p approaches 1 on the right edge of the plot (the last point plotted is p=0.9999), going undefeated trumps everything else. 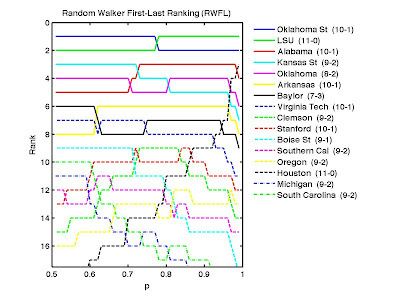 Houston climbs quickly to #3 near the edge and undefeated FCS Sam Houston State (not shown, but you can see the gap that none of the plotted teams is ranked #5 at p=0.9999 [click the plot to see a larger version]) rises quickly on the right edge from even deeper in the rankings, eventually passing all of the 1-loss teams at p even closer to 1. 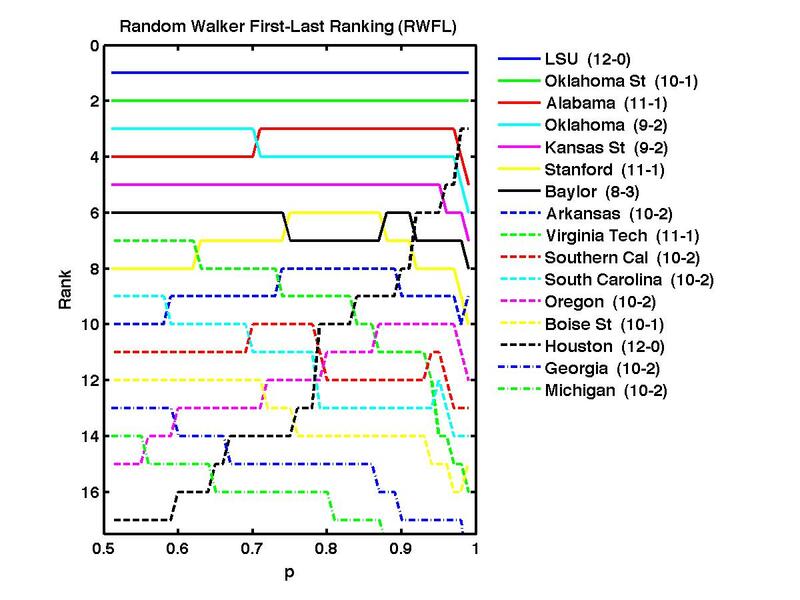 But at the middle ranges of p we consider (typically p=0.75), the game outcomes are naturally balanced with a notion of strength of schedule, with Houston at #17 for p=0.75 and falling as low as #21 in the left half of the plot (as p gets closer to 0.5). 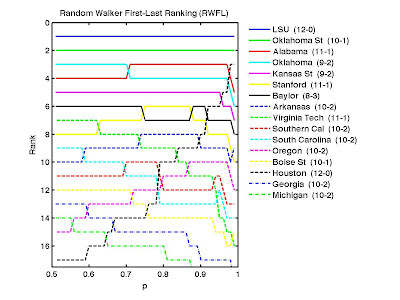 For a brief moment, the potential BCS Championship picture looks simple: LSU & Oklahoma State.